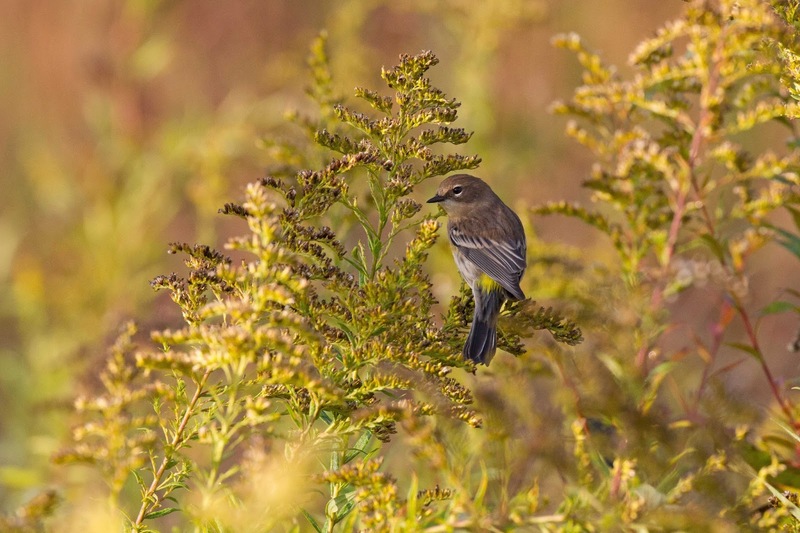 Birders wait all summer for fall migration. The anticipation is often too much to bear. 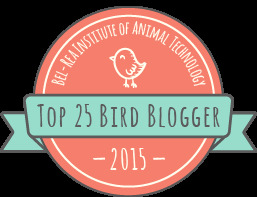 We go out in August searching for one or two early birds (get it? early birds?). Then we go out in September to see the start of the warblers and other songbirds. But it is October that promises the motherload of birds. 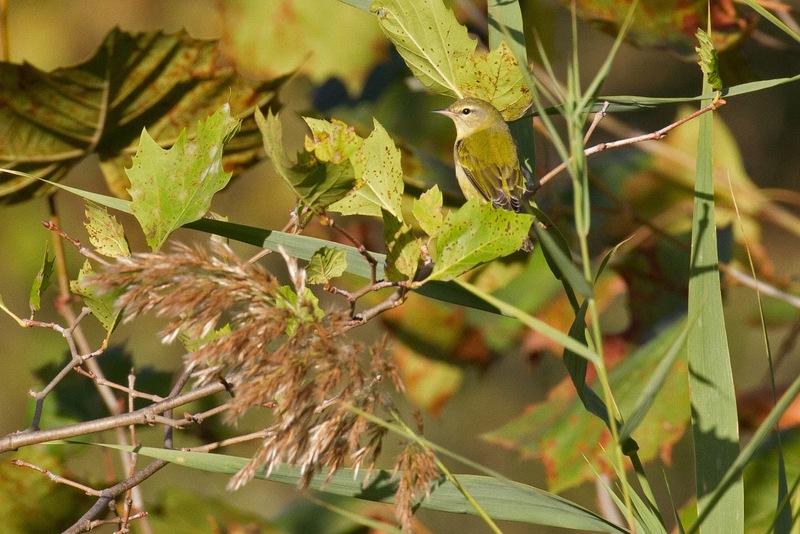 October brings songbirds, warblers, raptors, and more shorebirds. So you may be wondering why haven't I posted if October is so great. Well, this October hasn't been that great for me. The weather has really sucked. It has been cold and rainy and the winds have been all wrong. Boo. I have a few odds and ends to show you. 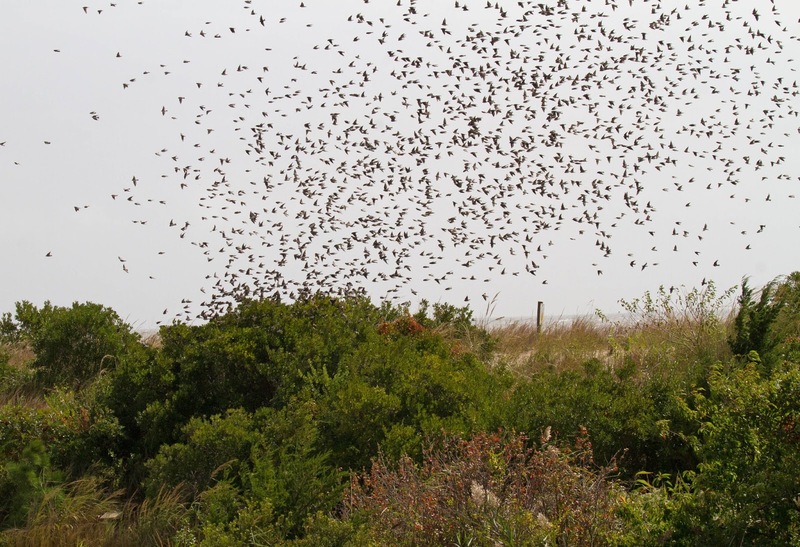 Here is a shot of a flock of swallows swirling around the dunes at Cape May Hawkwatch. And this is why they call it a Hawk Watch. 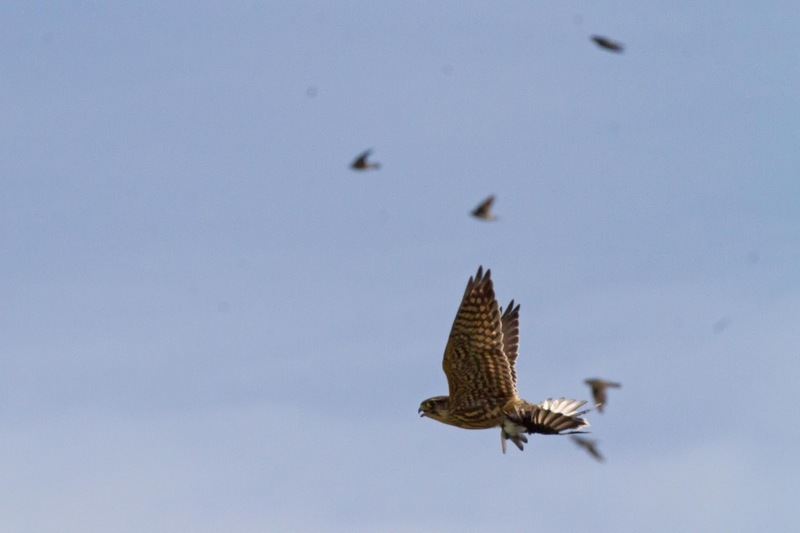 This Merlin was the reason that the swallows were in a tizzy. One of them didn't make it :-( The Merlin grabbed his lunch and flew off. You can see the poor swallow in the Merlin's talons. Merlins gotta eat too, right? Here is another hawk looking for a little bird to snack on. 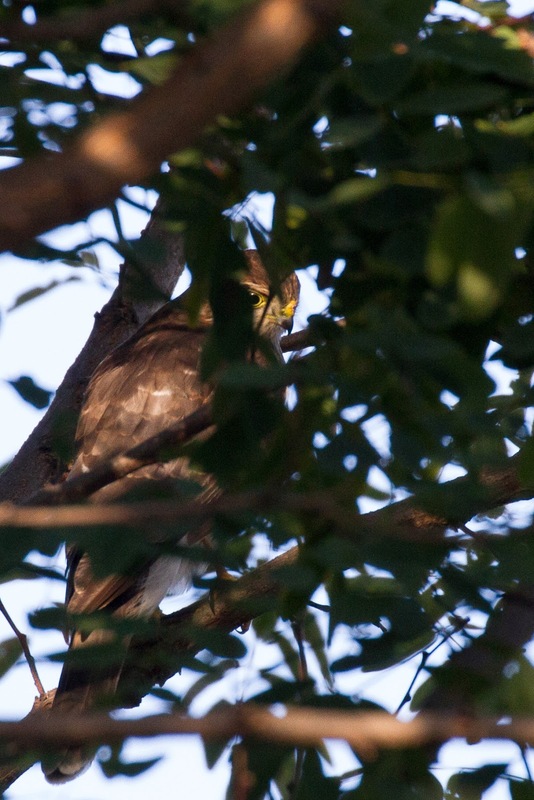 This is a Sharp-shinned Hawk that perched in a tree near my house. Check out his eye peering through the leaves. 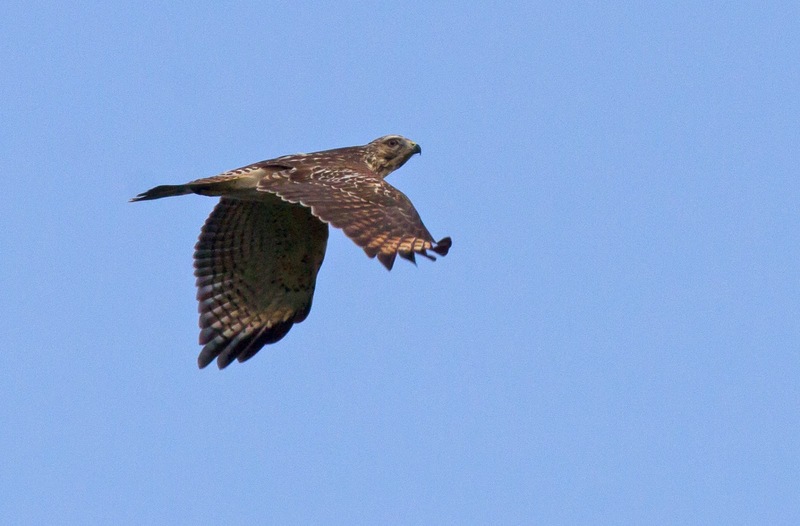 This Red-shouldered Hawk made an appearance at my new dog walking place today - scaring all of the other birds. This photo shows the field marks that allow ID in flight - windows in the wings. Other migrants are showing up at the new dog walking place too. 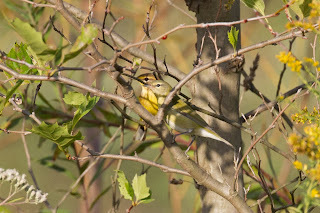 I have seen 2 Tennessee Warblers here which is unusual for me. This is a bird that is typically difficult for me to find for some reason. The field mark on this bird is that it is green, has an eye stripe and really pointy beak. 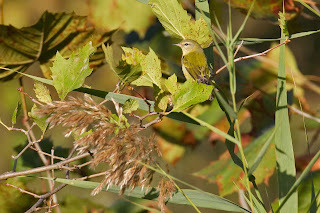 Here is the same bird with a Palm Warbler in the background. 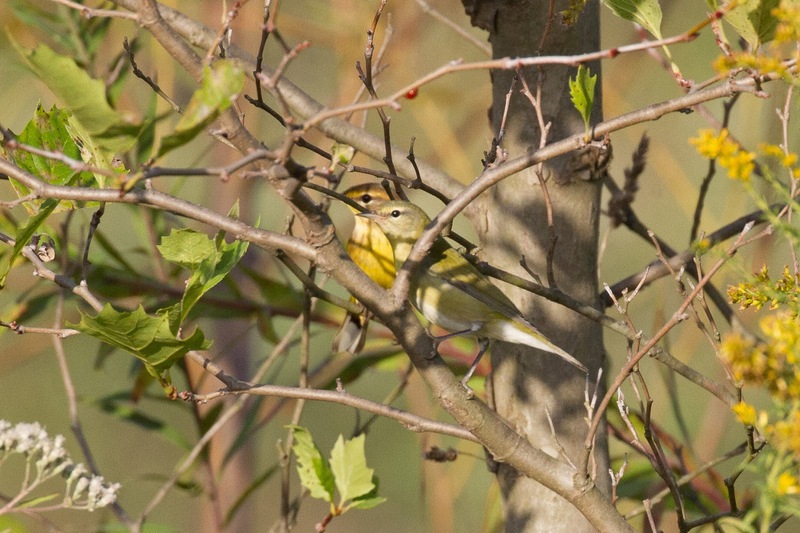 Yellow-rumped Warblers are one of the last warblers to come through in fall migration. 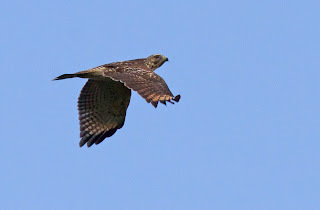 Us birders use this bird as a sign that migration is coming to an end. I love Yellow-rumps because they hang around most of the winter and they are pretty photographable. Here is one posing in Golden Rod. You can actually see the yellow rump. Of course, there is still plenty of fall left. Hopefully, the weather will cooperate and give us some more birds.